1. Put the flour, butter, sugar, and egg yolk in a food processor. Dribble in 1 tbsp water and blitz until the mixture comes together to form a dough. Tip onto a work surface and knead briefly to bring together, then wrap in cling film and chill for 20 mins. 2. Heat oven to 180C/160C fan/gas 4. Roll out the dough to the thickness of a £1 coin. Use your 8cm heart cutter to stamp out heart shapes – you’ll have to re-roll the trimmings to make 20 biscuits. 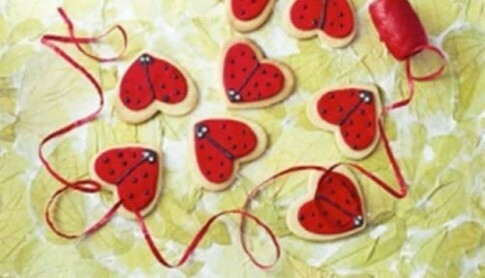 Put the hearts on baking trays and bake for 12 mins, until pale golden and crisp. Leave to cool on a wire rack. 4. Mix the icing sugar with enough water to make a thick icing. Dye the icing with the black food colouring. Pour the icing into a piping bag with a small plain nozzle attached (or use a small sandwich bag and snip off the corner). Roll out the red icing to 3mm thick and use your 6cm cutter to stamp out hearts. Stick onto the biscuits with a little of the black icing. 5. Use the black icing to give your love bug a head at the pointy end, draw a line down the centre to give it wings, then add spots, then leave to set on a wire rack. You can pack your love bugs into boxes or cellophane bags to give as gifts for Valentine’s Day.